1) A material’s capability to dampen sound. 2) The process of a material dampening or “absorbing” sound. A reflective panel hung in the auditorium, generally above the audience, that is used to direct sound into desired zones. Often decorative in nature. The science of, and study of sound. The acoustics of a room or space depend on its size and shape and the amount and position of sound-absorbing and sound reflecting materials. 1) What an actor does. 2) Segments of a performance, usually separated by an interval. So the first part is Act 1, the second Act 2, and so on. A curtain (sometimes designed for a specific show) that is opened to signal the beginning of a performance. The Front Curtain is often used for this purpose. 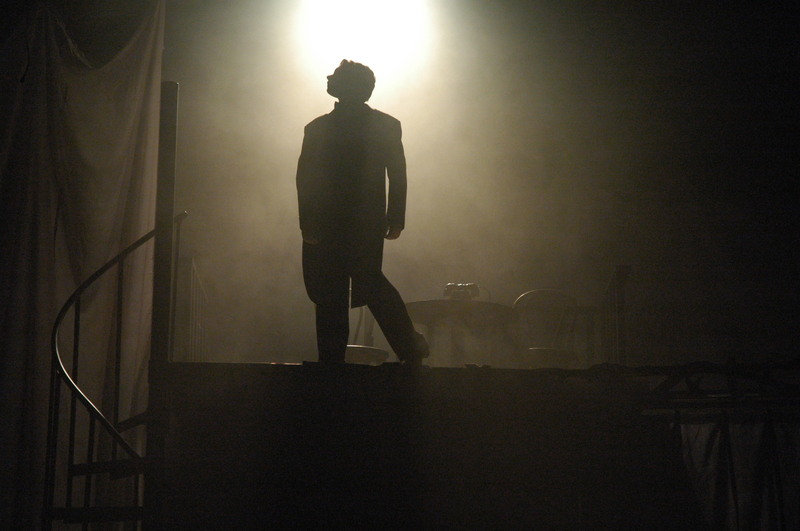 The area of the stage setting within which the actor performs. It may include areas off the normal stage. A speaker that has a built-in amplifier. The back of an active speaker uses XLR cables. It also requires IEC cables for power. To fade up lighting channels not already plotted in the current state. The mixing of colour from one or more lanterns focused on the same point on stage to produce another colour. The distancing of the audience from the action on stage so as to retain the theatrical illusion. The mix of background noise and other reflected sounds that make up a room’s acoustic character. General indirect light, produced by reflection from the stage, scenery, or by scatter from lanterns.. Stepped banks of seating surrounding an arena. Also used to describe one of the tiers of a multi-level auditorium. An electronic device that amplifies sound signals to a point where they great enough to be heard through a speaker. A part of the stage projecting towards or into the auditorium. In proscenium stages, the part of the stage in front of the curtain. See Forestage. A carriage or rack that contains weights, usually flame cut steel or cast iron, in sufficient quantity to balance a load. An area located below an opening in the stage floor that permits greater travel for counterweight arbors and pipe battens. A performance space with seating all round the performers. Examples include theaters, basketball courts, and indoor rodeos. Light from behind the actor or a piece of scenery. It is highly sculptural light which separates the actor from the background. 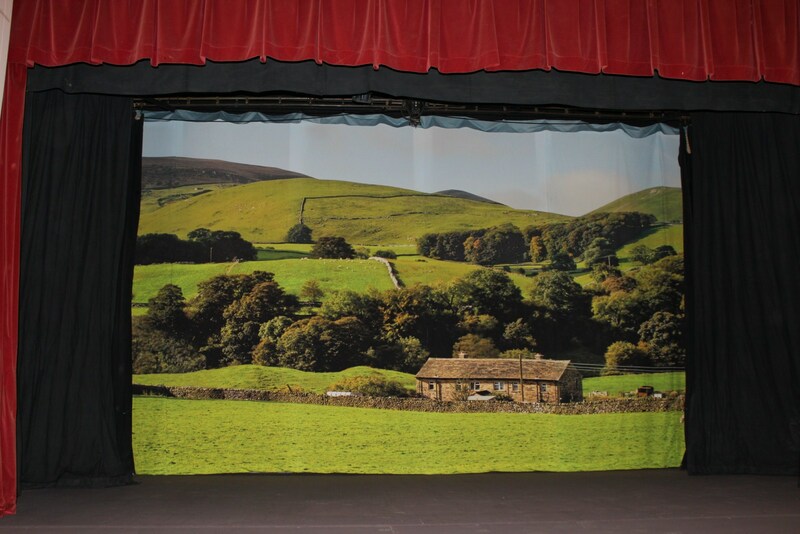 A curtain (usually with painted or printed imagery) used as a background for theatre productions. An audio cable in which the two audio lines, positive (hot) and negative are kept electrically separate from the earth. A way of reducing hum and noise on the cable. A tube, pipe or barrel for holding lighting fixtures. Adjustable doors attached to the front of stage lanterns to control the area of light covered by a particular beam. A horizontal rail, usually of wood, used by ballet dancers when practicing. Length of metal pipe, suspended on a set of lines, to which scenery and curtains may be attached . It is a standard part in a unit of the counterweight system. Room from which light, sound, projection and effects are operated. This room is found behind the audience seating area. Sometimes the show may be controlled in a cordoned off area within the audience seating area. It can also be sometimes referred to as “ops”. Framing the top, back and sides of the stage with black drapes. A fast shutdown of all lighting to complete darkness. Stepped seating blocks which can be retracted for storage and to clear a flat floor. Audience blinders – high intensity flood lights mounted to focus on the audience. Turned on to create an impact on the audience and perhaps cover a scene change. Two flats hinged together on the vertical. 1) A vertical lighting bar. 2) A moveable arm attached to a stand supporting a lantern, microphone or camera. A clamp used to hang a lantern from a boom. Flown scenic piece or curtain designed to conceal the upper part of the stage and its machinery or lighting equipment. Line used to pull and retain any piece of hanging scenery or property from the position it would occupy if left hanging free. Lever on a counterweight system that locks the rope, so stopping accidental movement. Walkway above the stage or auditorium used to reach stage equipment. A short length of cable or chain used to distribute the stress on a barrel at a suspension point. The process of moving all of a company’s equipment in/out of a theatre. This includes scenery, props, lanterns, costumes and so on. Industry standard cable connector system. The fabric used to form a cloth or to cover a flat etc. An imaginary line that running through the centre of the stage from upstage to downstage. This line is used by designers and technicians to position various technical elements in the theatre. The middle of the acting area. Abbrev. CS. A manually operated chain hoist used to lift truss, rigging bars, flying speakers etc. When multiple chain blocks are to lift 1 item is used, it is vital to watch the speed of the other operators so that the item is elevated evenly. A motorised winch that uses metal chain to lift heavy objects. Widespread usage in the concert production industry to fly speakers and lighting equipment above a stage. A sound or light control circuit. A repeated sequence of changing lighting states. ‘G’ or ‘C’ clamps are normally attached to lanterns and are used to fasten them to the lighting bars or battens. Overloading a piece of audio equipment by feeding in a signal too great for the unit to handle, thereby leading to distortion. A type of colour changer on a follow spot. Mechanical device, usually manually operated, used to insert colour gels in front of a lantern. Often used on follow spots. The translucent filter material place in front of lanterns to create a coloured illumination. Colour filters can be made of glass or gelatine, hence Gel, but today are usually made from a synthetic plastic material. Gels in a Gel Frame or Gel Holder. Holder for the colour medium or filter which slots into a set of guides in front of a lantern. An audio unit that reduces the dynamic range of an audio signal, often used as a protective or control device for audio systems. Mechanical system for flying scenery in which the weight of the pieces of scenery is balanced by adjustable weights in a cradle running up and down in guides in a frame normally at the side of the stage. Double purchase systems gear the movement of a counterweight to half that of the scenery it is supporting. Loose term covering all those who work on a show backstage. Lighting or sound change where some of the channels increase while others decrease. The signal that initiates a change of any kind during a performance. In addition to its normal definition relating to draperies, a term used to indicate the start or end of a performance such as “Five minutes to curtain up” (five minutes to the start of the performance). The imaginary line across the stage immediately behind the proscenium which marks the position of the house tabs when closed. A cloth which has a part cut out to reveal another cloth set behind, the cut-out portion is often filled with gauze. Plain stretched cloth or rigid structure (usually white) used as a background to a setting. Sometimes the cyclorama is curved at the bottom and side corners to give the illusion of infinity. A direct injection box is used to feed the output of an electronic instrument e.g. a guitar, bass, turn-table or keyboard straight to the audio system. This image shows the audio signal flow when a D.I. is used. The predetermined level to which a suspended scenic piece is raised or lowered to take up its correct position in the setting. Complete darkness on stage, used to hide scenery changes or to create dramatic effect. A loose term used to refer to an audio or lighting console. This image shows a lighting desk on the left and a sound desk next to it on the right. Electrical device which controls the amount of electricity passed to a lamp and therefore the intensity of the light. Dimmers are normally numbered sequentially, and the numbers shown on the Lighting Design in next to the relevant lanterns. The dimmer is controlled from the Lighting Desk via a low voltage control signal. In control of all aspects of the production. They develop the concept of the production, brief the designer and lighting designer, plot the actor’s moves, rehearse the actors and more. The electrical panel where incoming mains power is split into individual circuits, via circuit breakers, for distribution through a building. Also known as DMX 512. DMX stands for Digital Multiplex. It is a digital lighting data protocol standard widely used around the world. This uses a 3 pin XLR connector… the same as in the audio field. Please note: the voltage of audio and lighting equipment is different. Connecting an audio device into a lighting device (or vice versa) via a 3pin XLR will cause equipment damage. DMX was developed using a 5 pin XLR connector. Many manufactures also use a standard 3 pin XLR on their devices. Another term for Follow Spot. (Known as a Dome because often that was where the lantern and its operator were situated, in the dome in the auditorium). Moving scenery or equipment more than necessary because it was not correctly positioned in the first place. Light from above the actor, the beam perpendicular to the stage floor. Can be use as a colour wash without the light directly hitting the scenery. Portion of the stage closest to the audience. When told to move an item “downstage”, you move it towards the audience. Any unspecified fabric hanging in folds as a scene or part of a scene, especially curtaining fabrics such as woolens, velvets etc. Curtains hung both to mask the back-stage area and to shape the on-stage area. Normally made of wool surge. Operating cord of a set of traversing curtains. Frozen blocks or pellets of carbon dioxide – when placed in hot water melt to produce a mist which, because it is heavier then air, will hang close to the floor. Thin strips of cloth used to mask cracks between flats. The range of an audio signal from its lowest to highest level. 1) The members of the electrical team. The electric team mainly work on lighting. 2) All of the electrical (lighting) equipment. Almost always now abbreviated in writing and speech to ‘LX’. Sound and lighting term: to increase (fade up), decrease (fade down) or eliminate (fade out) gradually the brightness of a lantern or the volume of a sound. The control knob or slide that provides the means of controlling the output level of a lantern or amplifier. Arrangement of scenery forming an arch immediately behind the proscenium opening. See also teaser and tormentor. The loud squeal produced over speakers when a microphone that is on gets to close to the speakers. Curtains fixed at the top and raised (opened) by drawing the bottom upwards towards the top and/or sides. A non-flammable curtain hung directly behind the proscenium that protects the audience from fire or smoke emitting from the stage. The first row of lanterns hung on a bar behind the proscenium. A lantern that projects a diffused, un-focused beam of light. Used for general illumination. Normally found on the forestage pointing up stage, can be permanent or mobile. A canvas covering for the floor of the stage. The cloth can be painted to resemble some surface, but be easily removed to reveal another cloth, or the stage floor below. To lift above the level of the stage floor by means of sets of lines from the grid. The term flies is also used as an abbreviation for fly gallery. A gallery extending along a side wall of the stage, some distance above the stage floor, from which ropes used in flying scenery are operated. The fly galleries are usually referred to collectively as the flys. Heavy rail along the on-stage side of a fly gallery, equipped with cleats to which the ropes can be- made secure. Also called pin rail. The space above a stage in which scenery can be flown out of sight of the audience. Metal plate with a hinged ring used for scenery suspension. 1) The space above the stage in which scenery, lanterns and so on are hung invisible to the audience. 2) The counterweight system. To direct and “lock off” a lantern in its specified stage area. 1) Adjusting a lantern to give it a well defined image. 2) The process of adjusting and directing the lanterns prior to the technical rehearsal. Can be ‘The Focus’. Sound reinforcement from loudspeakers on the stage or side of stage to enable actors to hear their musical accompaniments clearly, and to hear their own voices when the sound is heavily reinforced for the audience. A hand operated lantern mounted on a swivel stand that emits a high intensity beam of light used to follow an actor on stage. Portion of the stage floor in front of the curtain line. See Apron. Scenic cloth battened all around. Arrangement of several flats battened together and flown as one unit on a set of lines. A type of spot light with a Fresnel lens, which due to a set of concentric circular ribbing on its surface, gives an even field of light with soft edges. Sometimes a painted cloth is brought down near to the house curtain for a front scene to be played on the forestage. This front cloth usually masks scene changes behind it. A light coming from downstage of the subject, generally brought in 45 degrees off full front. Areas of a theatre on the audience side of the proscenium wall or stage area are called FOH. Heavy duty cloth adhesive tape with many uses in the entertainment world. Flat curtain of fine mesh mosquito netting or similar fabric, either painted or unpainted, which when lit solely from the front appears to be opaque, but when lit from behind becomes transparent. It is used for transformation scene or other illusions. A fabric known as “Sharks tooth gauze” is also used for this purpose. Traditional fixtures which are focused manually and controlled by a dimmer. Examples of traditional fixtures are Fresnels, Strip lights, Par cans, Profiles, Pin Spots, Multi-Pars. A metal plate with a pattern punched out of it and placed in the gate of a profile spot to produce an image or outline on stage. Sometimes referred to an an E.Q or Graphic. Advanced audio tone control unit that allows very precise control over the frequency spectrum at a number of centre frequencies. A room for for the actors to meet and relax. It is located Back of House. Once common, green rooms are rarely found in modern theatres. Framework of steel or wooden beams over the stage used to support the sets of lines employed in flying scenery. A small ‘H’ shaped frame used to stand a lantern on the floor. Attaching flying pieces to the appropriate bars. Strips of striped gaff tape (normally black and yellow) that is used to bring attention to a potential hazzard especially in low light conditions. Commonly used on steps and protruding tripod legs etc. White gaff tape is also commonly used to draw attention to potential hazards. Device compromising three or more sheaves set together either in line or parallel to each other on a common shaft and attached to the grid directly above the fly rail. The lines from the three or more loftblocks in a set are brought together at the lead block and pass on down to the fly rail cleat in a hemp set or to the weight cradle in a counterweight set. The permanent staff member in a theatre who runs the electrics department. The term is usually employed to signify lines used for flying scenery which are made from vegetable fibre as distinct from the steel wire ropes used in the counterweight system. Hemp lines are hauled up manually and tied off on a cleat on the fly rail. A hemp house is a stage equipped with these hand operated “hemp sets” and no counterweights. The highest part of the audible audio frequency spectrum. A clamp on a lighting fixture that “hooks” over a bar and is tightened onto the bar by a bolt with a plastic knob that can be tightened by hand. An area on the stage on which the lighting is unintentionally more intense than the other areas. The main curtains between stage and audience, normally placed immediately behind the proscenium. Power lead with an IEC plug (also referred to as “Jug Plug” or “Kettle Plug”. Flying term for bringing down. The warning “Bars coming in” may be shouted when bars are being lowered. Another term used to refer to a lighting fixture or lantern. A non-climbable frame used to hang lanterns from. The light source within a lantern, but also used to refer to the complete unit. Also known as Bulb, Globe, Envelope, Bubble. One of the many words for a theatre light. Other names are Luminaire, Instrument, Light, Fitting, Fixture, Lamp. Electrical Insulation tape (electrical tape or insulation tape). It can be made of many plastics, but vinyl is most popular; it stretches well and gives an effective and long lasting insulation. In theatres it is mostly used for preventing rolled cables from unravelling, securing cables to truss etc., labeling equipment and labeling cables. It comes in a variety of colours. An abbreviation for Light Emitting Diode. Many lighting fixtures are starting to use LEDs as they require less power and don’t need dimmers. This is a lighting fixture that uses LEDs. One LED Par Can can produce many different colours of light. Section of stage floor that can be raised or lowered or tilted to provide differing levels of acting area, or to enable changes of setting to be made in the stage basement. Also Known as a bridge. A batten of low voltage narrow angle lamps, usually 8 to 10, wired in series, used to create a narrow strip of intense light. The drawn plan detailing what lanterns will be used where, in what way, with what colour, and on which dimmer. Audio level standard, pre-amplified from microphone level. Usually common to much electronic audio equipment such as CD & DVD players and effects units. The knob on the side of a lantern which tightens onto the harness to stop the lantern tilting. In a counter weight system the handling rope passes through a rope lock attached to a locking rail which runs the length of the counterweight wall frame. Sheaf in a metal frame bolted to the grid and used to pass a suspension line; there is one block for each line in a set. See also Set of lines. 240 volt AC power standard available in all buildings wired to the power generation grid in Australia. To hide any equipment or offstage area through the use of curtains, flats, etc. A curtain or piece of scenery, not necessarily painted, used to cut off from the view of the audience any part of the stage space which should not be seen. Crew person responsible for the operation of stage machinery and other related tasks. The frequencies at the middle of the audible audio frequency spectrum. Sound control desk, used to mix and adjust levels of sounds from various sources. Also known as a mixing desk or mixing console. A light that has motors and other equipment attached that allow such things as movement and colour selection to be controlled remotely. Now becoming a major force in lighting design for all types of events because it can both dramatically reduce the number of conventional lanterns needed, and produce visually very exciting effects. A multi-par is an upgrade from the traditional par can. The fixture allows for beam and field adjustment using interchangeable lenses. Backstage area outside the performance area. 1) Inside the acting area. 2) Towards the centre line. Abbrev. to OP. The right hand side of the stage as viewed by the cast. Also called Stage Right, Camera Left. Flying term for up. In is down – which prevents confusion with Up and Down Stage. Rigging a spotlight standing above a lighting bar rather than suspending it below the bar. Metal bar on which is hung a group of Par Cans – usually 4. Used to simplify lighting rigging – instead of each light having to be hung individually, groups can be attached. Type of lantern which holds a par lamp. The parcan is the basic lighting unit in concert lighting. A speaker that requires an external amplifier in order to produce sound. Back of a passive speaker. You can see the 2 ports for the Speakon connectors. Position above stage level on the stage side of the proscenium wall either side of the opening. Show portal, or teaser and tormentors, or similar arrangements of masking pieces which remain in place throughout a performance, regardless of scene changes. A way of sending a voltage, usually 48v DC, to a device such as a microphone down the same cable that carries the audio signal from the device. Many sound desks have phantom power facilities built in, or a separate unit can be inserted into the microphone circuit as required. A type of 240 volt mains plug that also has a socket on the back to allow additional plugs to be added. The area below the front of the stage. May be used to house the orchestra. Also called the Orchestra Pit. A spotlight which projects a profile or outline of any chosen shape and with any desired degree of hardness or softness of edge. Abbrev. to PS. The left hand side of the stage as viewed by the cast facing the audience. Also known as Stage Left, Camera Right. Props is an abbreviation of “properties”. Props are any items used by actors on stage (other than scenery or costumes). Doors on either side of the stage leading onto a forestage in front of the house curtain. Proscenium stage got its name from a large arch, the proscenium arch, through which the audience viewed the performance. Many modern proscenium stages no longer have the arch. A proscenium stage nowadays refers to a stage where the audience directly faces the stage and views only one side of the scene. Piece of timber or other material attached to the edge of an opening (e.g. a doorway) to give the effect of depth or thickness. Circular table forming a permanent part of the stage floor or standing upon it, on which scenery can be set for quick changing of scene or for creating various effects. Sometimes the revolve is formed of two or three rings and a centre, capable of independent or simultaneous movement, differing speeds and opposite directions. It can be turned through 360 degree either manually or by motor. 1) Noun – The lighting system as a whole, ‘The Rig’. 2) Verb – To hang lanterns on bars and connect with cables. 3) Often used to describe putting together any part of the show e.g. Rigging the set. A strong, rigidly constructed, well padded case to protect equipment from the vagaries of touring. Where there is no flying space over the stage a backdrop can be rolled and is than called a roller or roll drop. A portable platform usually in the form of a collapsible hinged framework (gate rostrum) with a separate top. Used to raise specific parts of the action or scene. A length of stage flooring that can be drawn off sideways leaving a long narrow opening(cut) through which a cloth or flat may be raised. A runner is also the name given to a length of carpet used offstage to reduce back stage noise. A pair of curtains parting at the centre and moving horizontally. A steel chain or steel cable used to attach hanging equipment (such as lighting) to the support structure as a safety support in case of failure of the primary hanging support (clamp etc.). A canvas bag filled with sand used to secure and weight scenery on the stage. Finely woven fabric which can be translucent or opaque using lighting from different angles. Small pieces of a scrim material is often used in front of lanterns to soften the light beam. Coarse woven Hessian, or similar material used in scenery construction. Unit group of suspension lines hanging from the grid for the attachment and flying of scenery; there are usually three or four lines in a set. See also counterweights. Line normally parallel to the front of the stage and just upstage of the house curtain, from which the positions of the scenery are measured. A shackle is a link that normally attaches the hoist’s hook (the hoist can either be a chain block or chain motor) to a spanset (sling). Grooved wheel (pulley) over which a line may be passed. Similar to a sandbag but smaller and filled with lead-shot. A device in a profile spot which can alter or change the beam of light. Foldback speakers set to the side of the stage. Light from the side of an actor facing the audience. Side lighting is often used in dance, as it emphasizes the entire body and movement. A suspension system where there is no gearing of pulleys. The counterweight and its travel will be the same as that of the object which is suspended. A device that produces the effect of smoke on stage. It operates by forcing a liquid mixture into a very hot chamber. The mixture, commonly called ‘juice’ or ‘fog juice’, becomes a gas and is expelled through a small nozzle. It emerges as a cloud of smoke. A Soco or Socapex cable refers to a cable that has Socapex connectors on its ends. In lighting, Socapex are used for power cables. The connector is normally attached to a multi-cored power cable that can carry 6 channels of power. Socapex connectors are also used for audio multi-cores. Socapex lighting headers normally have 6 female 10amp power sockets at one end converging in to a male socapex connector at the other end. The headers split the power out of the soco power multi-cored cable so that the lighting can be plugged into separate power channels. Each female socket will have its own number starting from 1 and ending at 6 to distinguish the 6 power channels. Socapex lighting tails normally have 6x 10amp plugs at one end converging into a female socapex connector at the other end. Tails are normally plugged into a channel on a lighting dimmer. Each 10amp plug will have its own number starting from 1 and ending at 6 to assist in distinguishing channels. This is a strong fabric strap usually used to connect truss to hooks. The part of a sound system that produces the actual sound that a person hears. The sound is produced by the vibration of a paper or synthetic cone by an electrical voltage in a wire coil. Speakon is a brand by Nuetrik and is short for speaker connector. Small adapter pin used to attach a lantern to a push stand or similar unit. Pulley fixed to the grid specially for a spot line. Single suspension line specially rigged from the grid to fly a piece of scenery or stage property which cannot be handled by the regular lines. Large piece of canvas, used to cover the stage floor, often painted to represent paving etc. The door to the theatre through which the cast and crew enter and exit the theatre. Not the public entrance to the building. The left side of the stage as viewed by the cast facing the audience. Also Prompt Side, Camera Right. The right hand stage as viewed by the cast facing the audience. Also Opposite Prompt, Camera Left. To clear the stage of scenery and other materials, or to remove a specific article. Lighting unit giving a fast series of very short light flashes under which action appears frozen. Set of legs (ordinary pleated curtains) hung from a curved or angled bar to form the sides and background to an acting area. Looped-up curtain, border or leg. A small piece of fabric or paint used to demonstrate the colour and/or texture of the material being used. Device for suspending a leg so that the angle of the leg in relation to the proscenium can be varied (Rotary Leg Unit). A metal bar with a slot down the middle mounted horizontally on a push-up stand, from which a small number of lights can be hung. Light directed on the house curtain before the beginning of a show or act. Border hung between the tormentors (legs), just between the proscenium opening. See also permanent masking. Length of cord attached by a grummet to a piece of scenery and used to secure the piece to an adjacent piece. Metal fitting attached to a flat or other piece, round which the throw-line is passed when securing adjacent pieces together. Type of stage which projects into the auditorium so the audience can sit on at least two sides. Narrow curtain or flat used to mask the wings, usually at right angles to the proscenium. Rails from which draw tabs are hung and along which the runners or bobbins travel when the curtains are moved; the track may be fixed or flown. Removable areas of the stage floor that allow access to the area underneath the stage. Special purpose traps are grave traps, dip traps and star traps. A rigging stand that sits on the floor that can lift a bar of lights up to a certain height. Also known as ‘winch ups’ due to the fact the stand is usually telescoped up by operating a hand winch attached to the side of the tree. The bolt that tightens a G-Clamp to a bar. Often called Tri Nut because many have a triangular plastic grip. To adjust flown scenery so the bottom is level with the floor. A low platform with wheels or castors on which a piece of scenery can be moved. A metal frame used to hang lanterns from. Comes in three main designs – flat, box, and tri – which describe the shape created by the frame. By virtue of their construction trusses are very strong and able to carry extremely heavy loads. Most truss is now made of aluminium for weight reasons and sections can be bolted together to produce long pieces. Used extensively in concert production to form the ‘roof’ over the stage from which to hang everything from lanterns to speakers. Truss pins used for bolt truss are simply short aluminium tubes which help align and strengthen truss joins. Batten on roller fixed to the bottom edge of a cloth, about which the cloth can be rolled upwards when not in use. General name for the costume department, its staff, and the accommodation they occupy. Wash lighting. Stage lighting focused on stage not in a specific spot, but more as a general lighting over an area. Several areas may be combined and balanced to effect an even light over the whole acting area. Wieland is actually a brand name, but it refers to the multi-pole connecter used for both motor cables and multi-cored power cables. Same as Soco Headers but with a multi-poled Wieland connector. Offstage spaces to left and right of the acting area. Setting comprising backcloth (or cyclorama) and pairs of wings (legs) with borders above. Sometimes cut cloths are used in the place of wings and borders (e.g. a woodland scene). The metal strip running over the top of a lantern to which the G-Clamp is attached.